One cannot avoid acknowledging this after a day or two reading the city planning board minutes from the 1950s and 1960s. For all the high-rise development proposals the board approved – and the board, as it was structured, was essentially the voice of the city’s professional planners – there are plenty that it rejected. What they approved, of course, is what we see, and this includes several of the city’s least-loved high-rise areas: the scattered apartment buildings throughout the Annex district, the extraordinarily dense concentration of high-rises in Saint James Town, the cluster of apartments in the residential area north of High Park, and so on. It must be said that there was planning logic at work in the approval of these projects – public transit access usually being the prime rationale – something that is often overlooked, and this alone tends to put them in a slightly different light. But it is the rejected developments, which of course we do not see, that provide the strongest evidence of the planners being more thoughtful and more judicious than they are generally given credit for being. 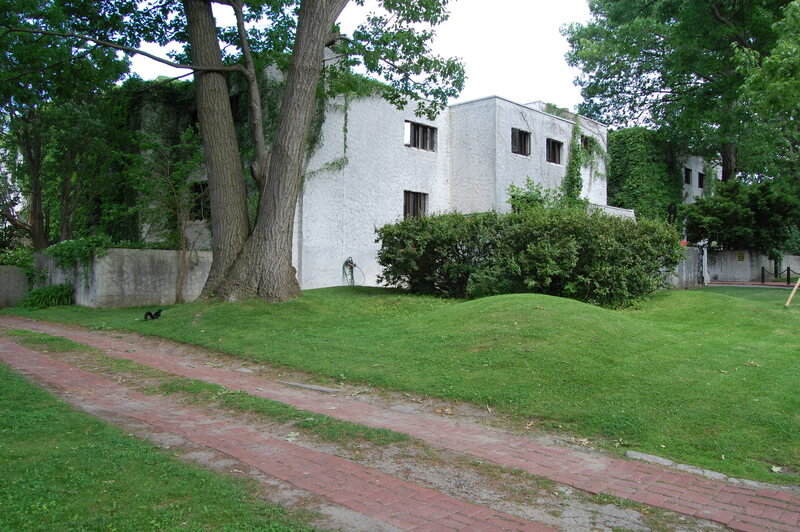 Among the earliest major projects to be rejected by the board was a scheme brought forward in March 1959 for the west side of the Don Valley just south of Bloor, site at that time of the palatial home of late industrialist and Conservative politician A. E. Kemp. Kemp had died in 1929 but his much younger widow remained in the home until the 1950s, at which time the property was sold to a group of three local developers who proposed to build a high-rise apartment building on the site – to be designed, they claimed, by architect Peter Dickenson. But the planning board rejected their proposal. The planners did see some merit in it, for the site was central and of ample size, both of which spoke in its favour, but they felt it was too close to existing residential areas and had insufficient road access, both of which spoke against it. The location was better suited to institutional uses, the planners thought, and soon after their rejection it was acquired by the school board as a site for a new public secondary school (now Rosedale Heights School for the Arts). Kemp family home overlooking Don Valley from the west side, c.1946. A pair of prints mounted side by side in photo album. Source: Toronto Reference Library, Baldwin Collection, S 15-39. The same year, 1959, the planners also decisively rejected a high-rise proposal for the east side of Hazelton Avenue, in the Yorkville area, just north of the old Heliconian Club. This was the first of several stands they took to protect Yorkville, which they believed was evolving into a rather special district – the “Greenwich Village of Toronto”, they called it in August 1965. Toronto’s planners played a greater role in Yorkville becoming the heart of the city’s counterculture than most people realize. One of their most curious rejections, both in terms of what was proposed and what resulted, was of a high-rise scheme for a residential street in the eastern part of the city’s Beaches neighbourhood – something that seems inconceivable now. It was proposed by a group called River Oaks Development Limited, about which nothing further came to light in the course of my research (though it was represented by a downtown Toronto law firm, so likely was local). River Oaks had acquired five contiguous residential properties on the west side of Beech Avenue, south of Queen Street, and felt that the assembled properties, taken altogether, formed a site large enough for high-rise apartment buildings (in the plural). The key, as with nearly all other such proposals, was that the residential lots – which had been laid out more than fifty years earlier – were unusually deep, extending more than half-way into the block; this in fact is likely what drew the developers to the site. 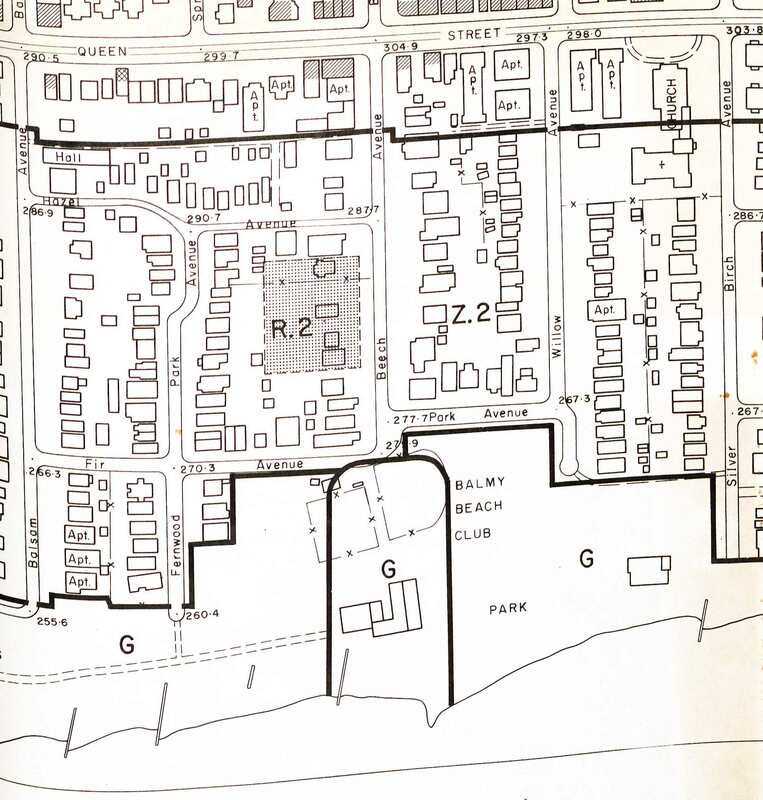 The lots did need to be re-zoned to a higher residential density, however, and the developer’s request for this, in November 1962, brought the proposal to the planning board for assessment – though the developer did not yet have a proposed building design. The City had no formal policy for high-rise development approval, but the planners had guidelines of their own – as noted above concerning the Kemp Estate – which they used to analyse the proposal. The area south of Queen Street, they felt, was in some ways well suited to high-density development: it was clearly separated from the larger residential area north of Queen, had plentiful open space, adequate public transit (though not rapid transit they noted – an observation that will resonate among those who ride the painfully-slow Queen streetcar today), and numerous nearby commercial shops and services. But this eastern end of the district, they observed, had limited road and water/sewer capacities, and since it consisted mostly of small lots, already intensively developed with numerous houses divided into rental flats, was unlikely to evolve into an apartment neighbourhood. Believing that neighbourhoods should be of a particular type, with an identifiable character, the planners saw this latter as a significant obstacle to permitting a single, isolated project. So they rejected it, noting that the western end of the Beaches, where housing was more run-down and major roads were more accessible, was better suited to redevelopment than the eastern. And with this the project disappears from the planning board’s records, one of scores of development proposals so rejected. But River Oaks still owned all the property, and had to do something with it for they likely had no desire to remain in the home-rental business. 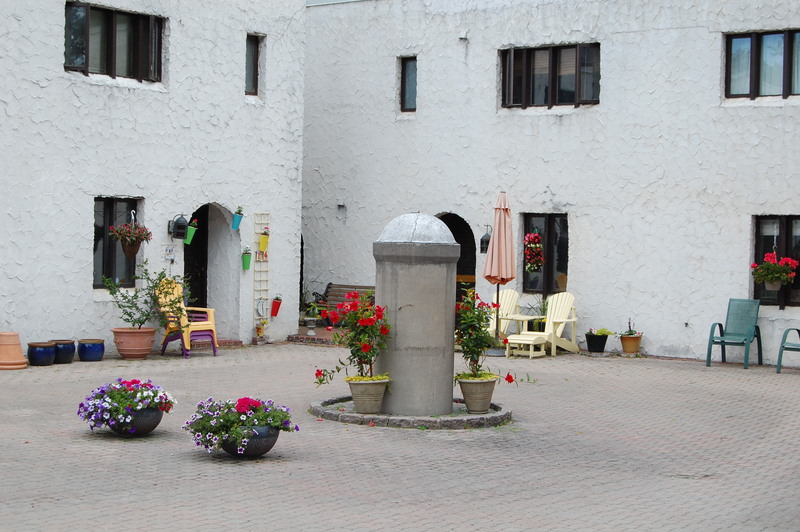 High-rise development had been rejected for the site, but low-rise had not – there were already several apartment buildings in the area – and a few years later a most unusual three-storey Mission Revival style townhouse complex called “El Pueblo” was built on the site, with a faux-adobe exterior, a flat roof, and a broad red-brick courtyard into which the units opened. 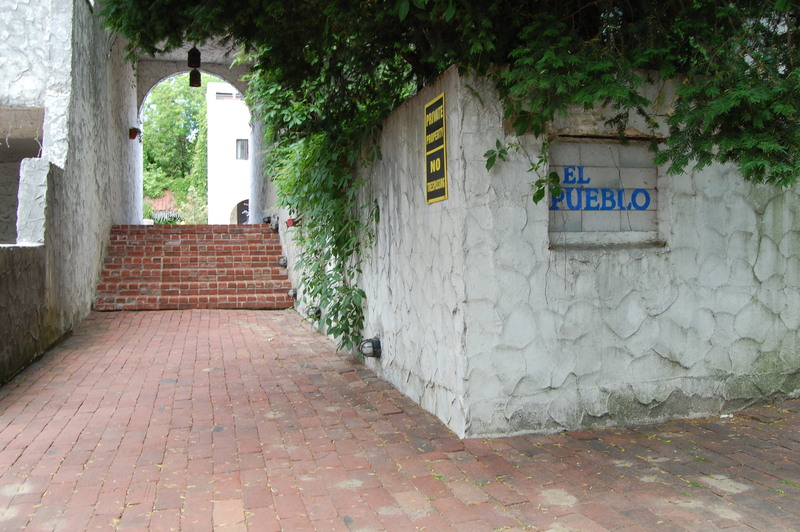 Who built El Pueblo (was it River Oaks, or did they sell the land to another developer? ), or even more intriguing who designed it – this style had been popular in the American southwest earlier in the century, but was rare in Toronto – seems to have escaped council and planning board records, which is understandable since a building that meets the zoning of its site does not usually require municipal review, and I have not taken the time to investigate further. This and following photographs by author, June 2016. The planners may or may not have wanted El Pueblo – they appear never to have seen, let alone endorsed, its design – but we know they did not want high-rise apartment buildings for the site, and that they saw certain advantages in newer buildings and greater residential densities, so in this sense they did get their way, at least within the limits of prevailing property rights, and thus must accept some responsibility for what now occupies the site. No doubt many historically-minded residents regret the loss of those perfectly sound old houses and would be happier had the street been left undisturbed. But the result is not all that bad; most of the mature oak trees were retained, and along with them much of the character of the neighbourhood. In fact to my eye, fifty years later, El Pueblo inserts some welcome architectural and social diversity into a staid, middle-class, Anglo-American street. 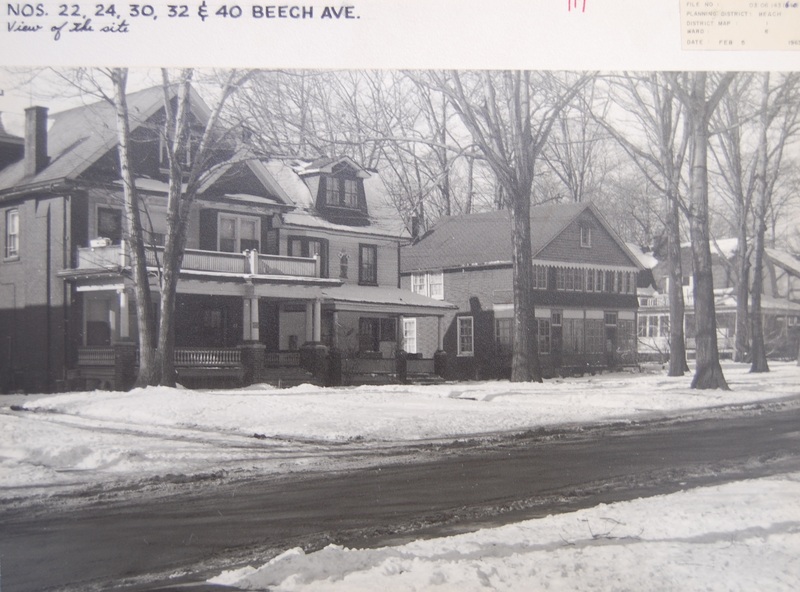 In any case, like it or not, the planners of the day were responsible for lower Beech Avenue not being the site of high-rise apartments, and most would agree that was for the best.